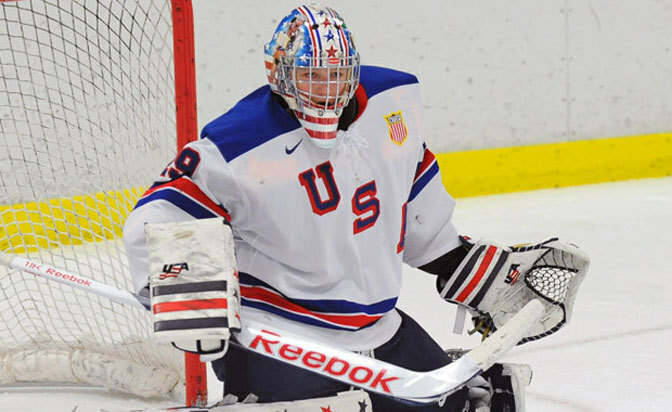 It shouldn't come as a surprise more than half the players invited to the 2014 United States National Junior Team selection camp on the campus of the University of Minnesota this week are also standouts in college. The fact is USA Hockey has traditionally scoured the collegiate ranks every year with the focus of bringing the best the country has to offer to the prestigious 10-team World Junior Championship. This year was no exception as 21 of the 29 players invited are starring for programs across the NCAA landscape. "The collegiate players are our bread and butter to where we end up on this roster," U.S. National Junior Team general manager Jim Johannson said. "I think the partnership we have with supporting U.S. junior hockey and USA Hockey as a whole has been vital to the unlimited growth of the American player both in college and the international scene. So it's by nature of structure that college hockey needs USA Hockey to be strong and, by nature of player development, we need college hockey to be strong." When the United States captured its first gold medal at the 2004 World Junior Championship in Finland, 17 of the 22 players were collegians. That impressive list included goalie Al Montoya (University of Michigan), defensemen Matt Carle (University of Denver), Mark Stuart (Colorado College) and Ryan Suter (University of Wisconsin) and forwards Zach Parise (University of North Dakota), Drew Stafford (North Dakota) and David Booth (Michigan State University). "They all want to be there and know the importance of the tournament to represent their country," 2014 U.S. National Junior Team coach Don Lucia said. "The colleges are proud to send their guys and it's been a great two-way street as far as the cooperation between USA Hockey and the college programs and those programs allowing their kids to represent their country for USA Hockey." The 2010 WJC in Saskatoon, Saskatchewan, was certainly a memorable one for the Americans as they defeated Canada 6-5 in overtime to win their second gold medal and snap the latter's five-year reign as tournament champion. That U.S. team had 11 college players, including defenseman Jake Gardiner (Wisconsin), and forwards Chris Kreider (Boston College), Derek Stepan (Wisconsin) and Kyle Palmieri (University of Notre Dame). "I think we have a lot of good coaches at the collegiate level," Lucia said. "It's a great development process because of the amount of practice we get to help make them better players; the weight training all year around. It's a good process where they're at." There were 14 college players on the U.S. gold medal-winning roster at the 2013 WJC in Russia. Lucia, who is in his 15th season as head coach at the University of Minnesota, knows from experience what an honor it is to have a student-athlete represent his country at the WJC. In 2010, he had forward Jordan Schroeder and in 2013, defensemen Mike Reilly and Brady Skjei. This year's select camp roster includes Golden Gophers Skjei and forward Hudson Fasching. "To have guys leave their program and represent their country, it is a tremendous honor," Lucia said. "I let the people around here know that the World Junior tournament is the Olympics for those players under the age of 20; it's the best players in the world other than a handful of guys playing in the NHL. "When you get down to the last few weeks leading up to selection camp, there's a lot of nervousness whether they will be selected and there's disappointment when they aren't. I had to share the news with a couple of my players that weren't going to be invited and it wasn't easy, but both are 1995-born and have another opportunity next year." University of Miami head coach Enrico Blasi will likely lose sophomore forward Riley Barber during the 11-day tournament that runs Dec. 25 through Jan. 5, 2014. Barber is one of three returning players from the 2013 WJC team that won gold following a 3-1 victory against Sweden in the championship game. "It starts with USA Hockey at the grassroots level and the way we've kind of developed our players over the years in leading up to where they're playing in college hockey," Blasi said. "When they're playing college hockey, they're playing at such a high level and with such intensity, getting the coaching and mentoring from all the college coaches they've played for." Barber, drafted in the sixth round (No. 167) by the Washington Capitals at the 2012 NHL Draft, had three goals, six points and a plus-1 rating in seven games at the 2013 WJC. The tournament was chock-full of NHL-caliber talent since it took place during the NHL work stoppage. "The [college] player understands the competition level and the pride it takes to play for your country at that point to go out and execute," Blasi said. "Obviously, teams that have won gold medals have a tremendous amount of skill and understood that they had to work as well. We're very proud of the fact college hockey has played a factor in how the World Junior team shakes out."